Donny Seyfer the executive officer of NASTF (National Automotive Service Task Force) and Partner in Seyfer Automotive in Wheatridge, CO. Listen to Donny’s previous episodes HERE. Chris Chesney is the Senior Director of Customer Training, CARQUEST Technical Institute, and a NASTF board member and a member of the ‘Road To Great Technician’ project. Listen to Chris’s previous episodes HERE. Jill Saunders is Curriculum Developer, Toyota Motor Sales, North America and a member of the ‘Road To Great Technicians’ project. Listen to Jill’s previous episodes HERE. Kyle Holt is the President of S/P2 (sp2.org). S/P2 serves businesses and career tech schools in the automotive service, collision repair, heavy-duty/diesel, welding, construction, cosmetology, and culinary industries. S/P2 is used by over 175,000 students and employees every year across North America. Listen to Kyle’s previous episodes HERE. The entire industry needs to participate in growing and keeping technicians. Dealers are having the same challenge. Churn is not good or acceptable to grow our industry. Toyota needs 1400 technicians per year to keep their dealer network supplied. Aftermarket heeds this. Military veterans are a consideration for Toyota. It starts at the dinner table. We need to get the word out to everyone who wants to listen. When kids are involved in a STEM class and or a youth automotive program they will cross-pollinate their friends. We need to get them involved so we can gain that advantage. Just one tactic to build it from the entry level. There is a video game to work on cars now. We need to remodel how we educate our students (all trades) from an outcome-based education to a more competency-based or master of a skills-based education system. Give the student to move when they are ready not as a project group. Career pathing is to have all students to have the same competencies. All they would have to learn about their new employer is their culture. Industry and education need to be attached at the hip. Mentoring will be a big part of this plan. We’ll never find mentors if they don’t know how and are paid appropriately. Find a mentoring program at SP/2. Go to SP2.org, send an email and ask for the mentoring system. It is in beta. We need the structure from a mentoring program, but outlining a career path is as important to the next generation of technicians. Career-pathing is an industry problem. Entry level technicians need to know how to move up to B tech and A tech and what other directions, such as parts, service. Competencies must be identified across the entire industry. In the early ’70s, ASE helped keep the government at bay and to engage industry and to create a standard to gauge the knowledge-based of the technician. We need to get an electrical diagnosis as simple as righty tighty lefty loosey. The industry needs to take its rightful place to support ASE and education. The educators need the tools to teach the competency-based skills. NASTF’s goal is to connect everyone. There are multiple initiatives going on across the country. Make their TMT a salary position so they can mentor and coach technicians. This position will monitor the quality of work they do. Our technicians are being poached by other industries that need technicians. Top shop operators looked at the outline and asked to adopt that person. In other words, they felt the outline was a home run. The FAA model of competency may be a perfect choice moving forward. How does it get done is the challenge. The technician gets a new certification from, for example, ASE. Jill Saunders is in charge of the Skills USA competition. We can learn from Skills USA which is a hands-on competency based test for secondary and post-secondary students. Students also are learning soft skills, like interviewing and writing a resume. Not all who come in our industry do not have support from home. We need to be there to lift the instructors, students and provide ‘in-kind’ donations and support to these institutions who are molding our future technicians. The onslaught of technology is putting us at risk because all of that technology is focused on safety. Who’s watching? NHTSA. (Safety and Cybersecurity) We need to get our act together before the government gets involved. The collision industry has been told that they will need to have a quality technician working in their shops because of the high tech nature of collision repairs. Consider that the collision industry will be looking to find the best technicians in the industry. There is an opportunity for mechanical shops to partner with collision shops to support their diag needs and mechanical work. ADAS technology has the training industry and equipment industry up in arms over what it takes for calibration of ADAS systems. The supplier of the technology in concert with the OE creates the calibration specifications. You must read and have the willingness to follow the directions and the discipline to read all of the OE specs. Technical reading skills will become an important part of training. You must follow OE directions to the letter. We need to support education to a higher degree than we’ve been doing. Industry and education must align. Anthony Williams has a dream of building PTECH (pathways to technology) School in Colorado Springs. A six-year public high school in partnership with public schools and the automotive industry. Need to build a consortium to build the school. Will have English, Math and History weaved into projects. Automotive Technology, Business, and Engineering will be the areas of focus selected in their sophomore year. 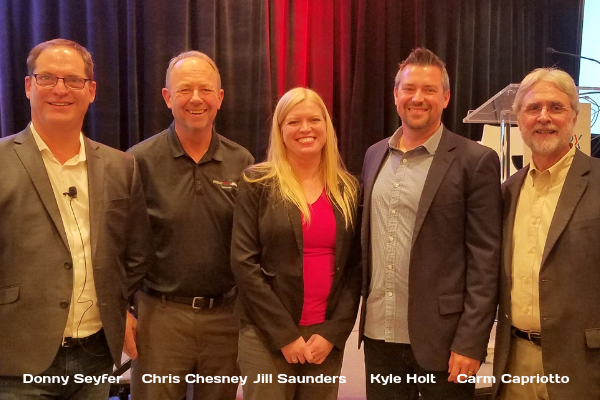 Thanks to Donny Seyfer, Chris Chesney, Jill Saunders, and Kyle Holt for their contribution to the aftermarket’s premier podcast.